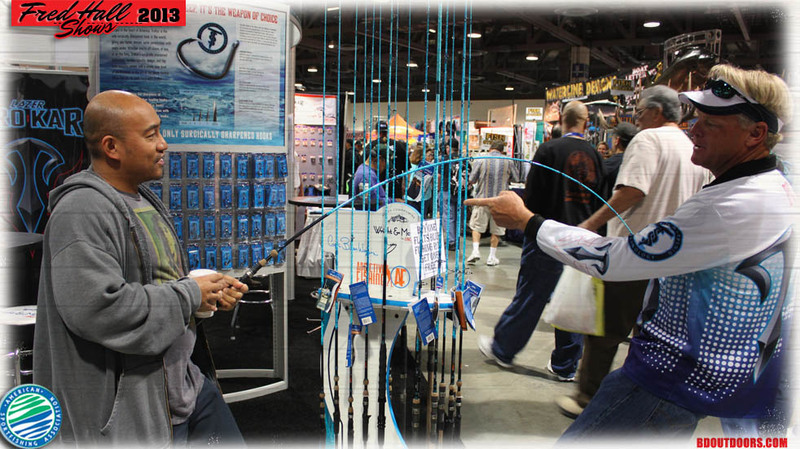 The Fred Hall Show Long Beach at the Long Beach Convention Center and Arena is the premier outdoor recreation show featuring the largest selection of the nation’s leading equipment manufacturers. 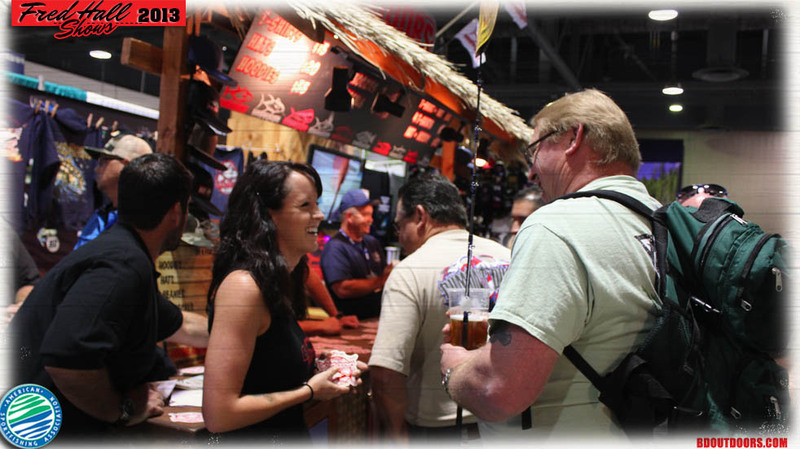 Gigantic crowds of passionate outdoor enthusiasts made their way to this year’s show in celebration of the great outdoors and the kickoff of the new season. The BD Booth was the place to get the newest BD Swag. Our BD Girl made everyone who visited our booth feel welcome and made sure they had a Bloodydecks sticker! 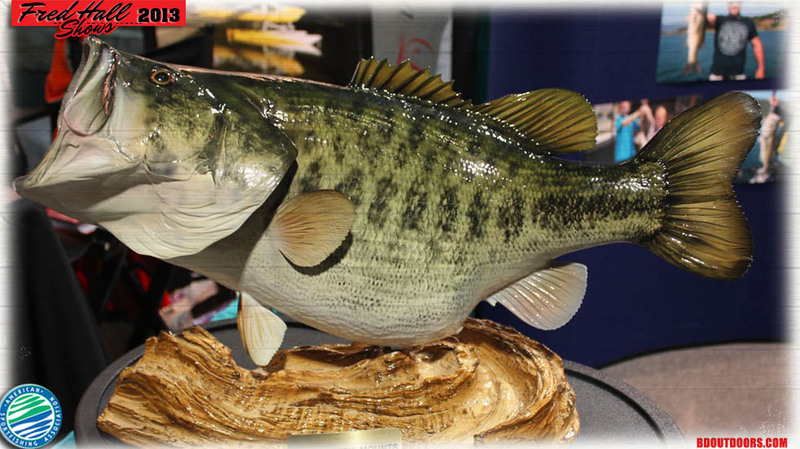 The new Calico Bass and Yellowtail designs for this year’s show. 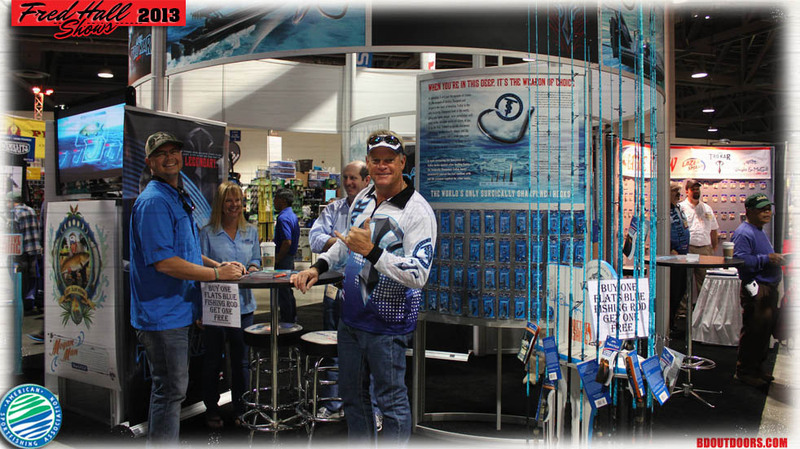 The always-friendly Bill Shed was on the floor with the latest Aftco gear, meeting anglers and talking about new gear. 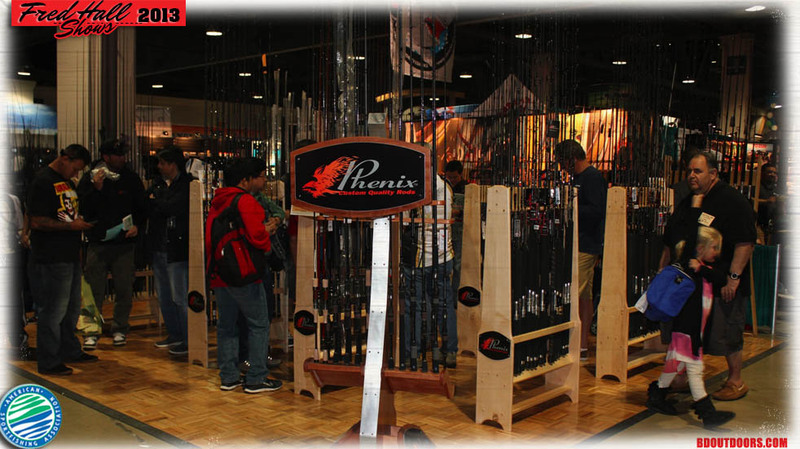 Phenix had all their latest rod designs on the floor. 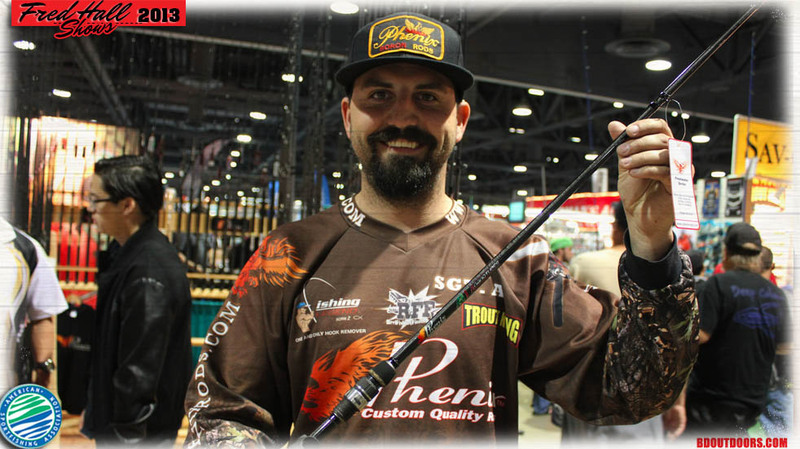 Phenix rods was in the house showing off the latest from their high-end line of rods. 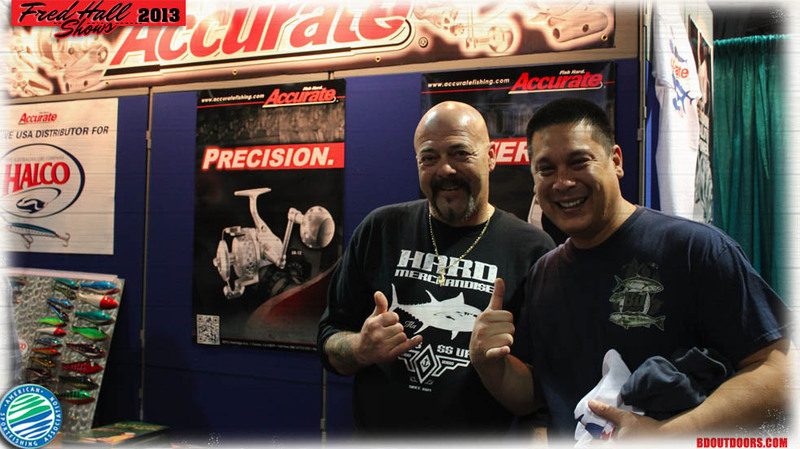 The boys from Accurate Reels brought Wicked Tuna star Capt. Dave Marciano out to the show for a couple of days. There was a line 50 deep all day to get a photo and an autograph from Dave. 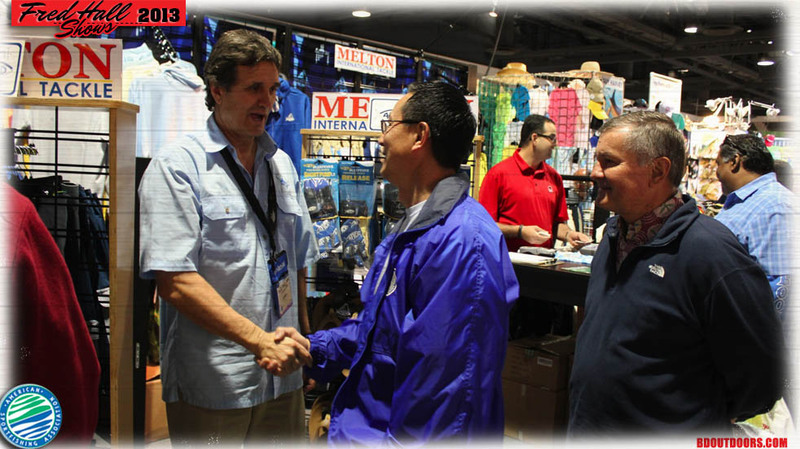 Dana Landing had another large booth this year featuring Fishworks, Maui Jim and Olu Kai Sandals. 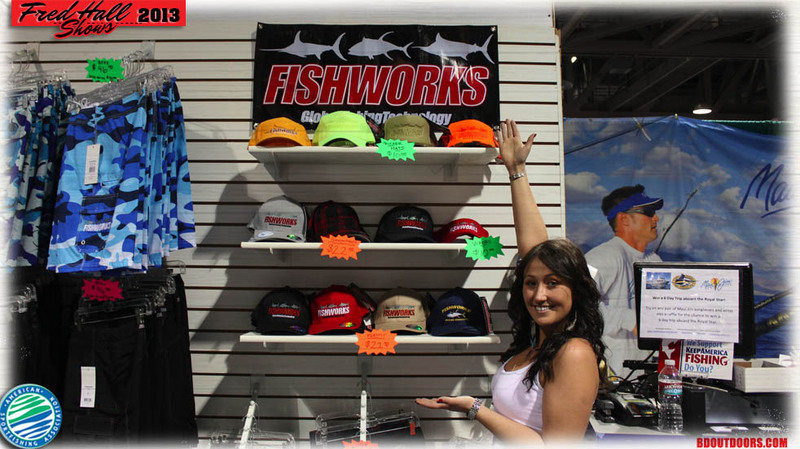 Chelsea from Dana Landing shows off the latest hats from Fishworks. 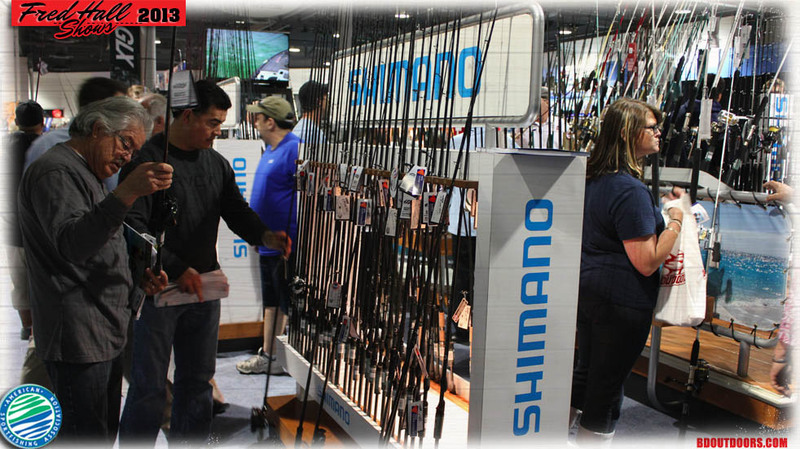 The Shimano booth was packed with people checking out the new Stella reels and Terez rods. 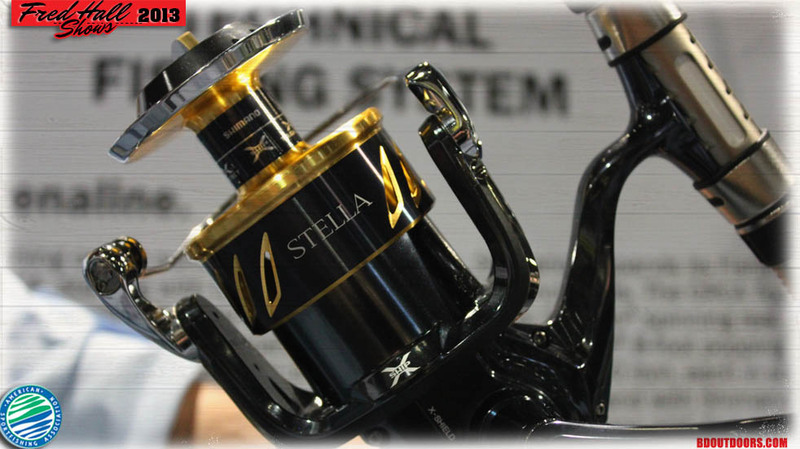 The new Stella SWB spinning reel was on display at the Shimano booth. 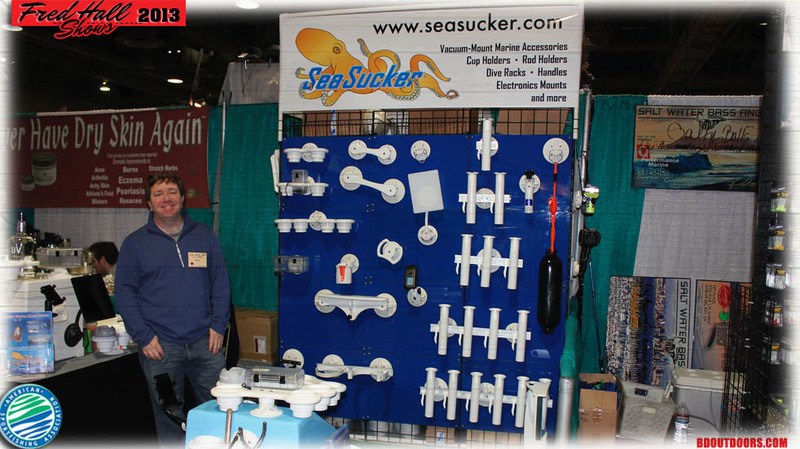 Sea Sucker had a full line of suction cup accessories for your boat. 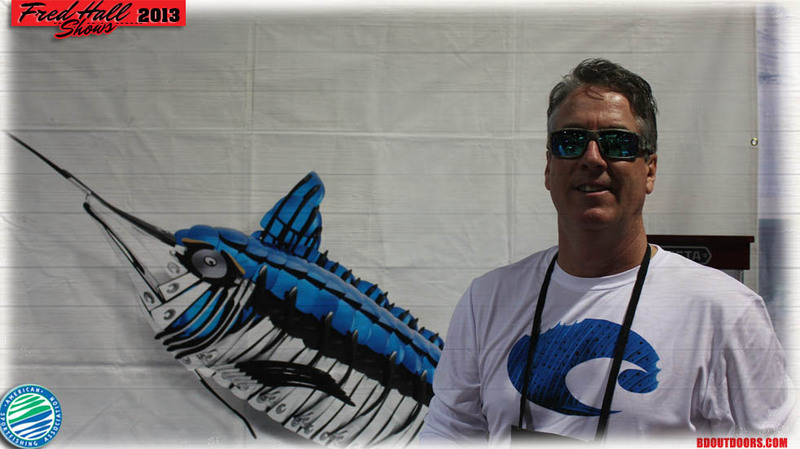 Squig from Fishworks shows off the latest in Fishworks apparel. The Bongos Super Chum girls were all smiles. 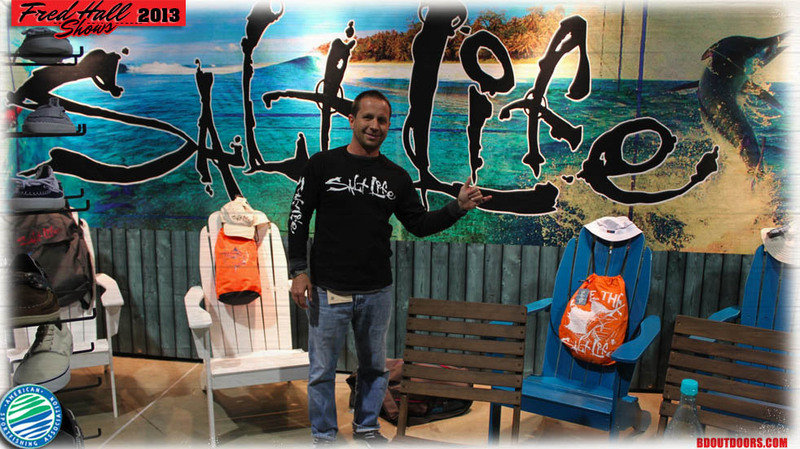 Salt Life apparel made their first appearance at the show this year. 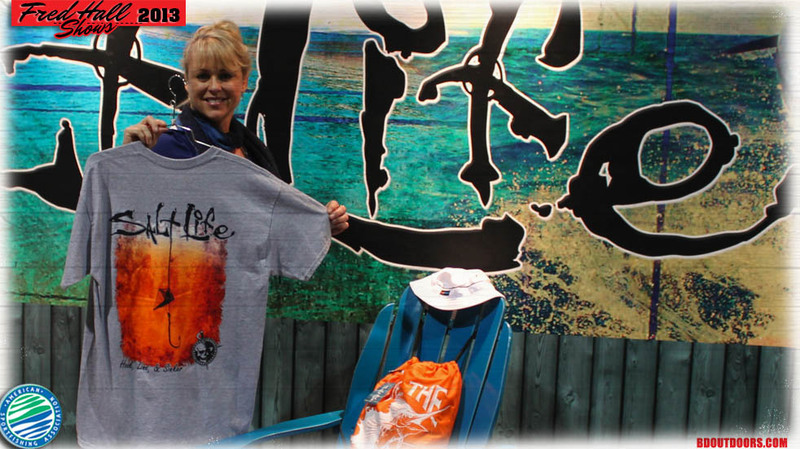 Several new Salt Life designs were on display at the show. 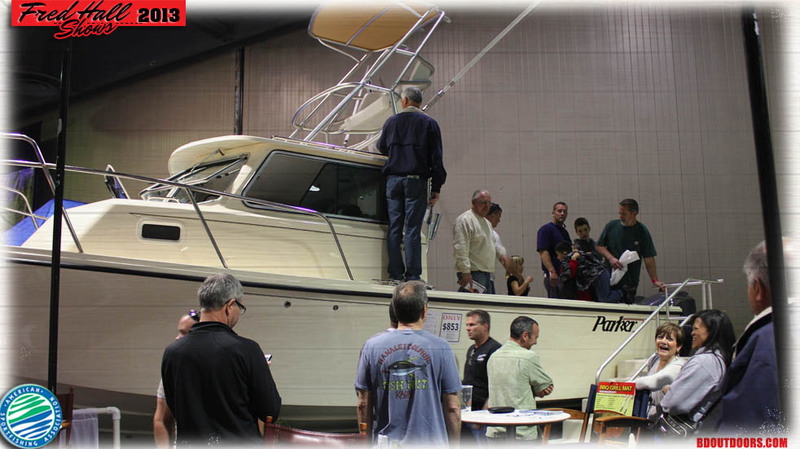 West Coast Marine had a few nice Parker boats on display like this 2820 Pilothouse. 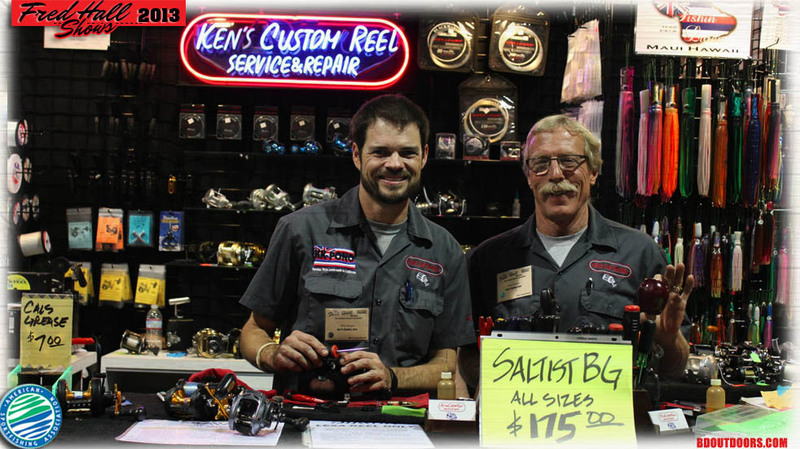 Ken and the boys from Ken’s Custom Reel in Oceanside were there as always. 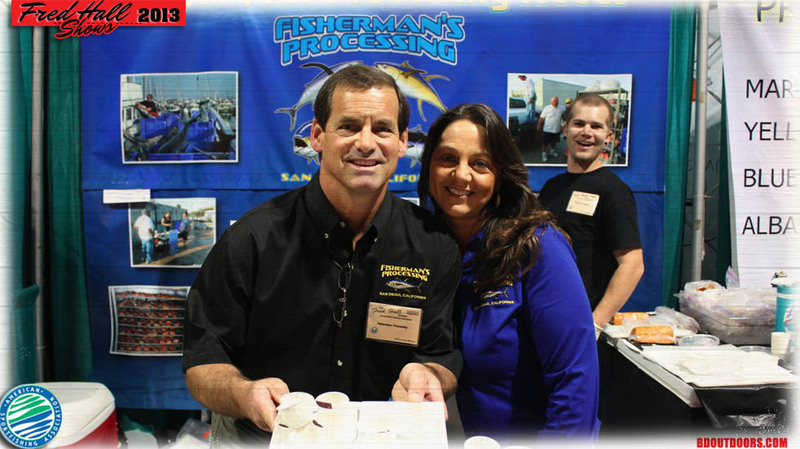 Fishermans Processing gives samples of their wahoo, yellowtail and tuna processing. 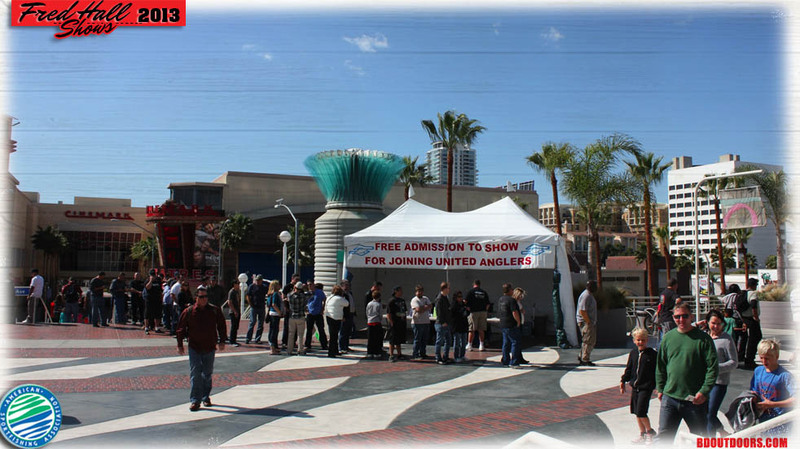 I must say personally I visited the booth a couple times. 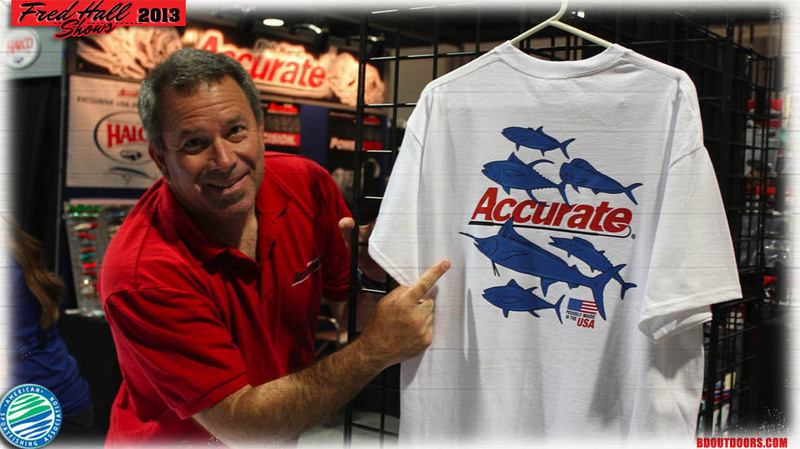 Ben Secrest from Accurate Reels shows off their latest t-shirt design. 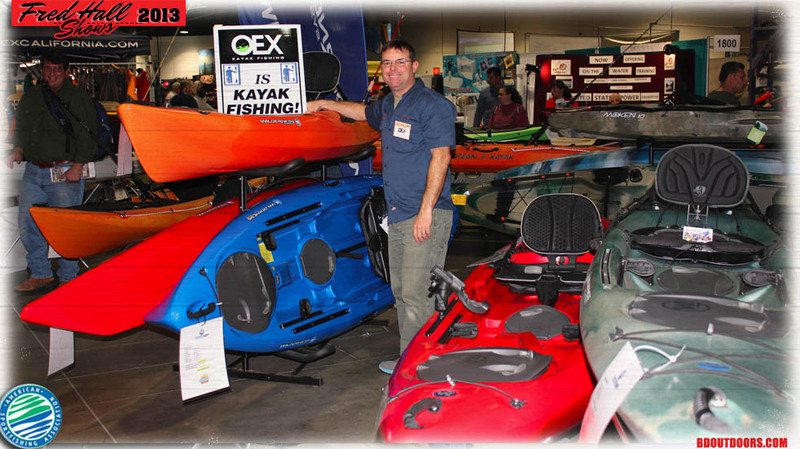 Brett Torgesson and the OEX team brought a load of new Kayaks to the show. 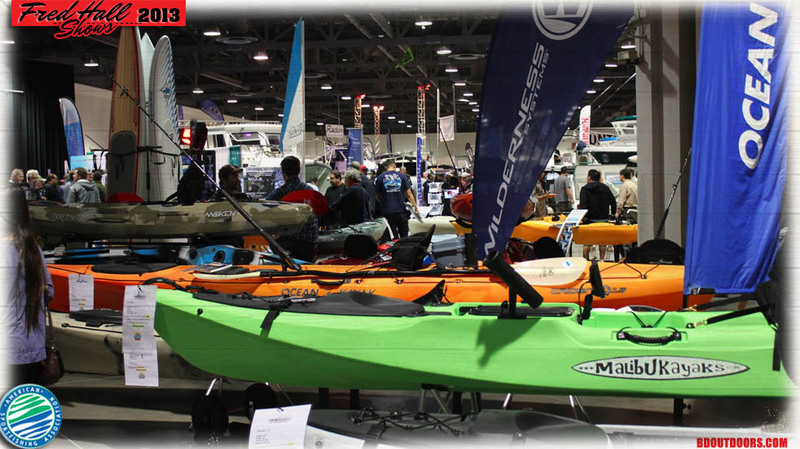 More Kayaks from the OEX crew on display. 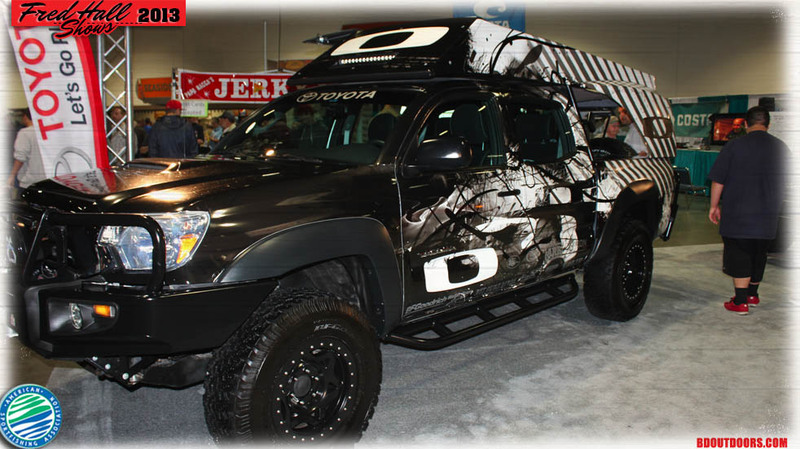 Toyota had a customized Tacoma truck that they partnered with Oakley to design. 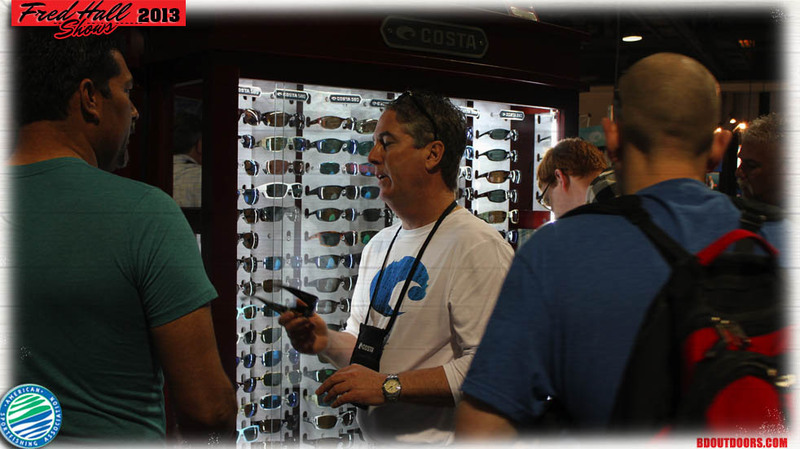 Bill Poupart from Costa was there showing off some of Costa’s cool shades and artwork. Bill hard at work promoting the Costa line up of sunglasses. 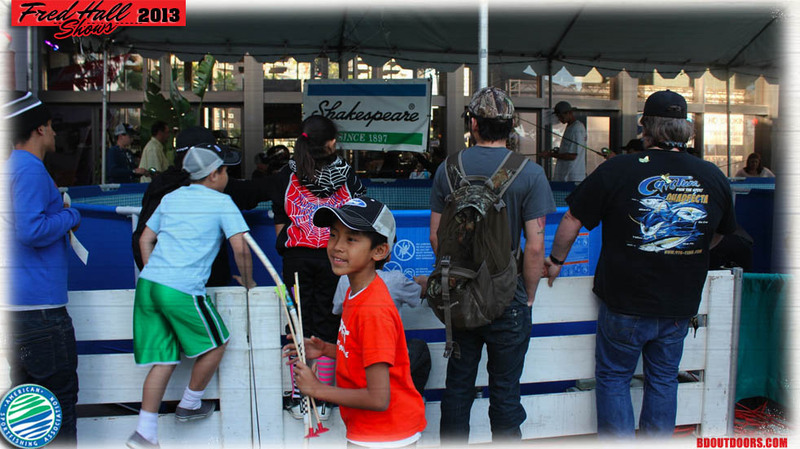 The Berkley kids trout pond is always a hit with the youngsters. 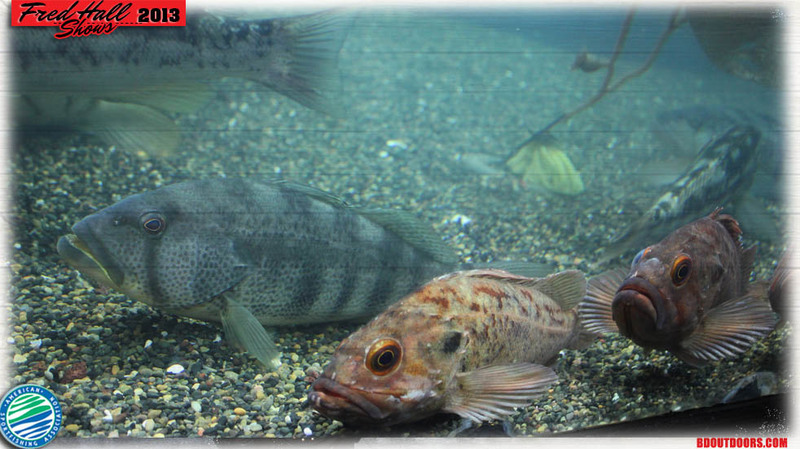 People and fish alike come to Fred Hall. 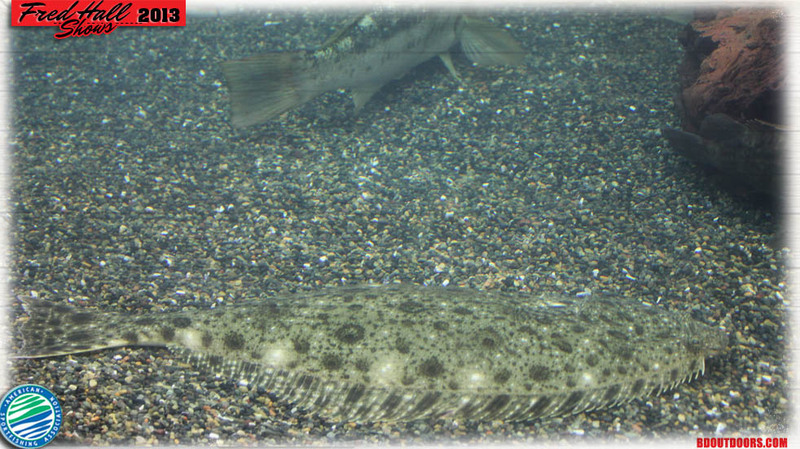 Californian Halibut chilling at Fred Hall shows. 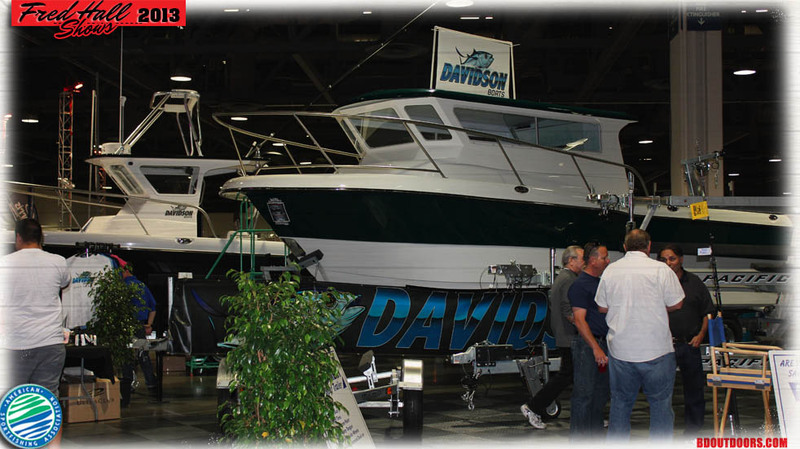 Davidson boats debuted their brand new 19′ and 31′ model pilot house boats. The 31′ was a monster that you can customize just about any way you’d like! The show had its fair share of beautiful ladies. 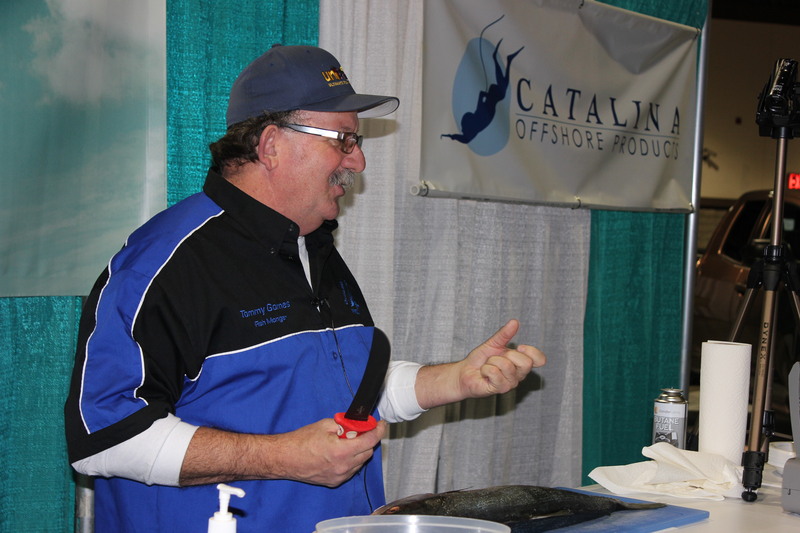 Tom Gomes showing off his fish monger skills at the Catalina Seafood display. Some happy attendees showing off their goods. 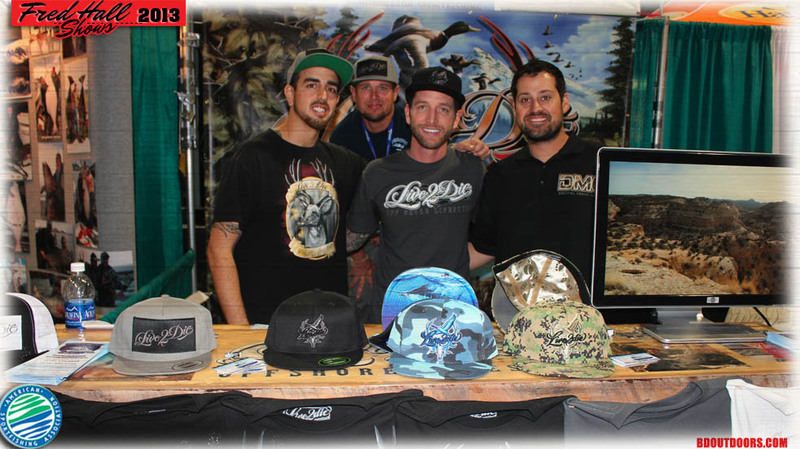 Live 2 Die had a booth promoting their line of hunting apparel. They had some really cool new designs. 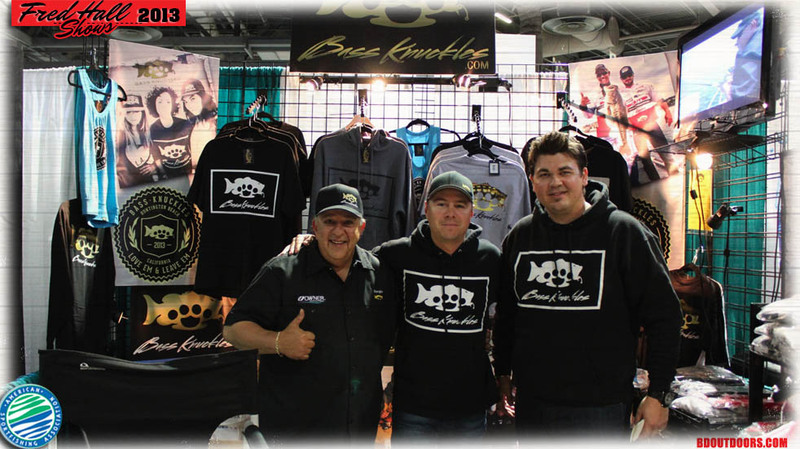 The Bass Knuckles team was on hand showing off their sweet Bass fishing apparel. Tommy Gomes and crew represent at Fred Hall. 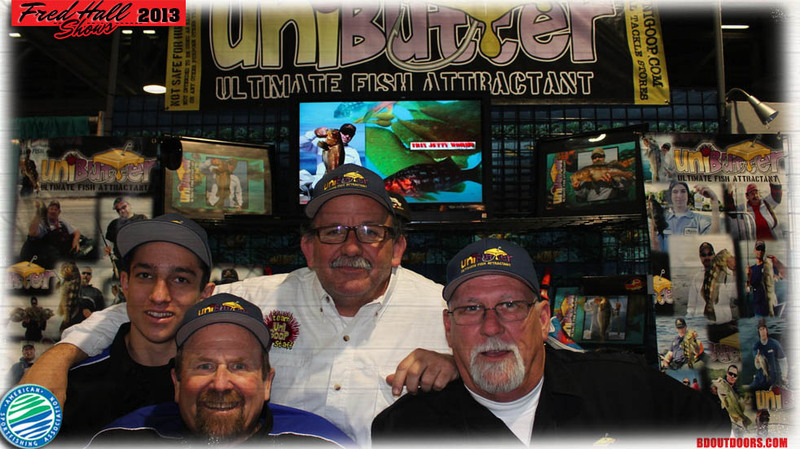 Get ya some Uni Butter. 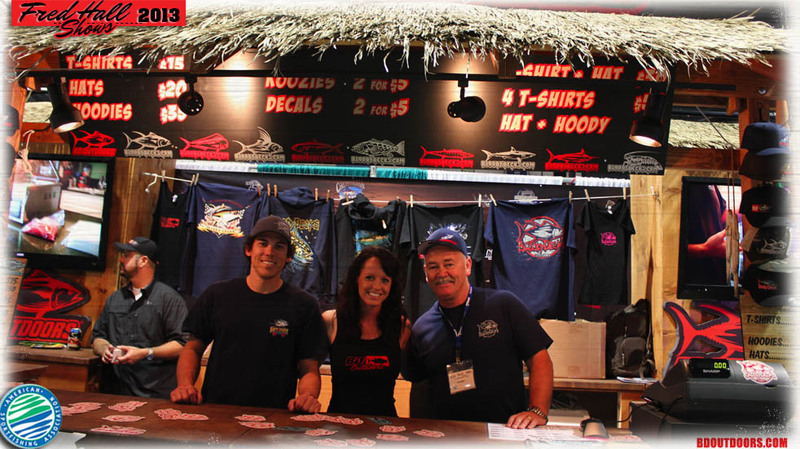 The girls from the Soft Steel line booth were looking good and selling some T-shirts. 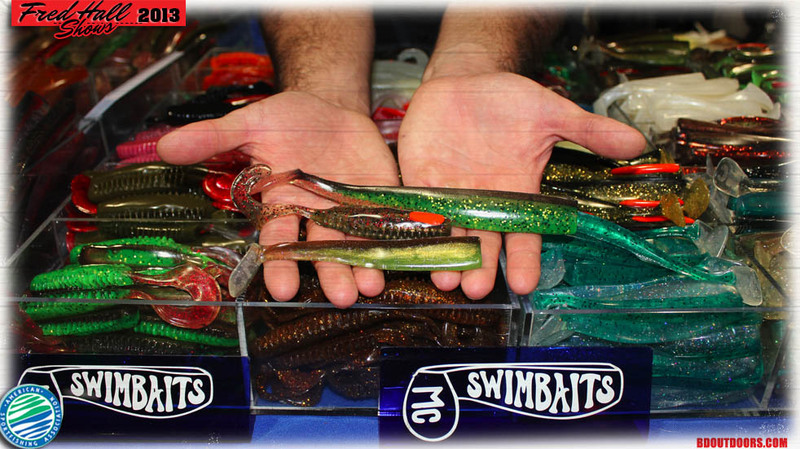 Cory and his boys from MC Swimbaits had a ton of different styles, colors and sizes of soft baits to check out. 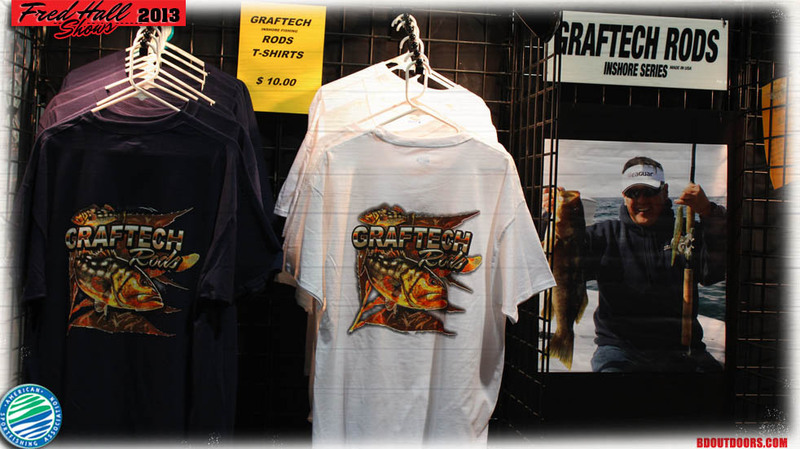 Graftech Rods had some great new models and their very popular Calico Bass t-shirts for sale. 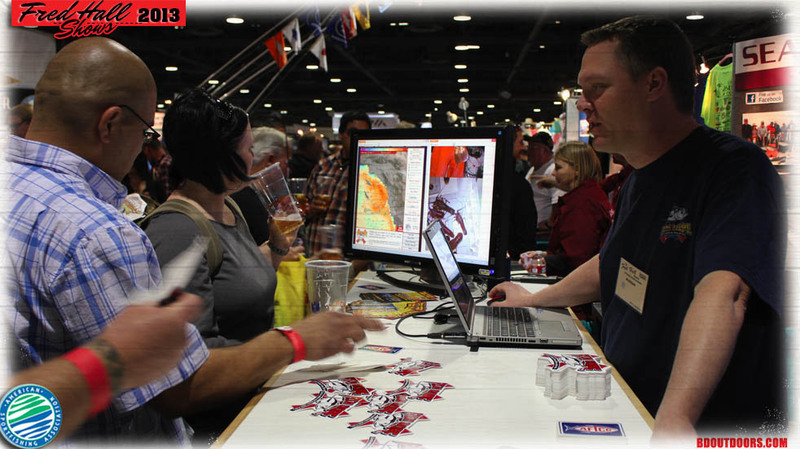 The BD booth was cranking as usual. 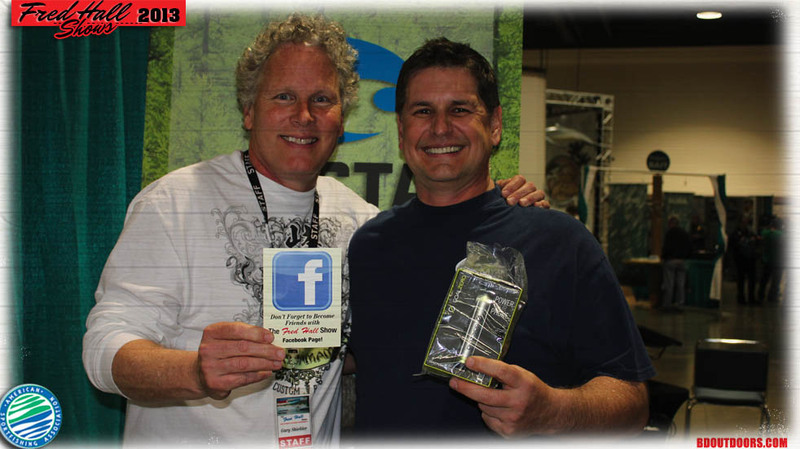 Blair Wiggins from Addictive Fishing reunites with BD’s Derek Redwine on the west coast. They are both from the Cocoa Beach area in Florida. 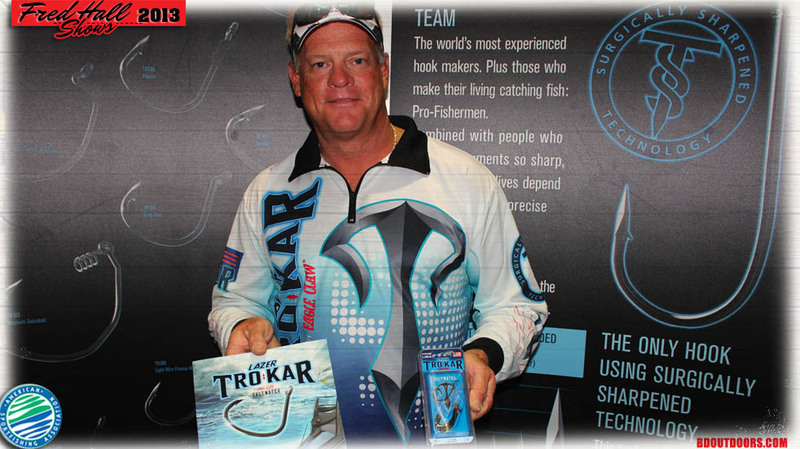 Blair Wiggins made his way from the east coast to show off Eagle Claw’s new Trokar hooks. 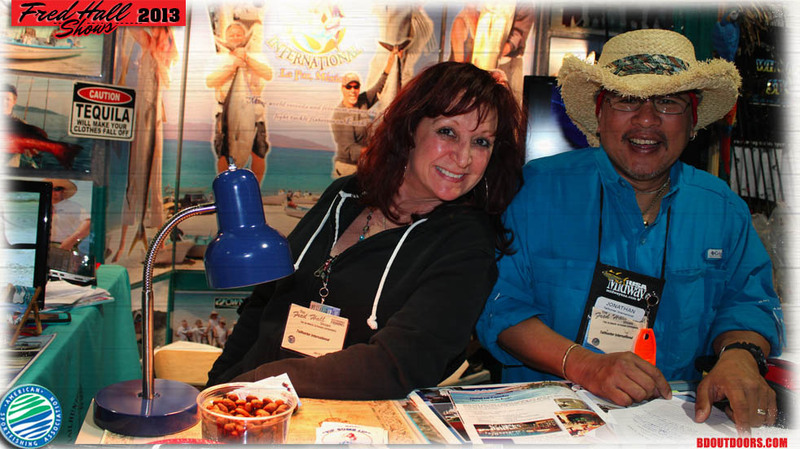 Jonathan and Jilly from Tailhunter International were at the show greeting their guests and meeting new people. 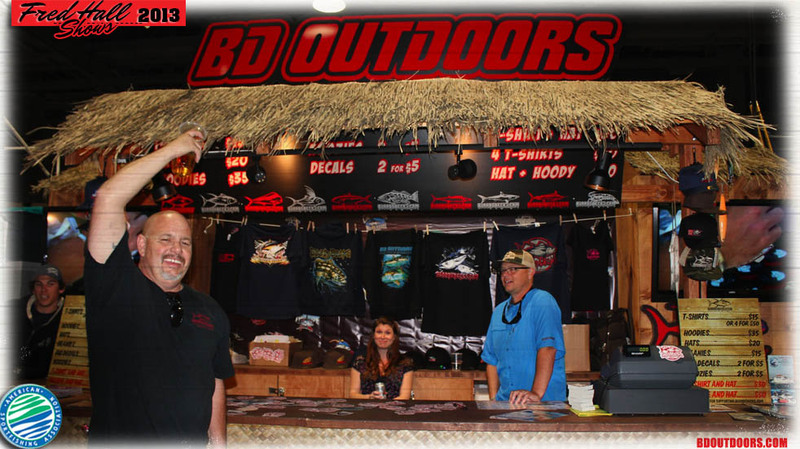 Bill Havens from Salty Dawg Rods had his first booth this year and almost completely sold out. I’m sure we’ll see him back next year. 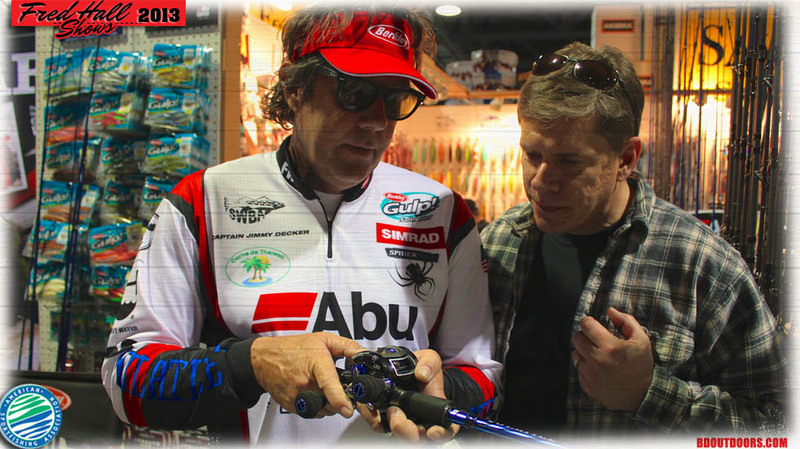 Blair Wiggins shows off the action of his signature rods from Wright and McGill. 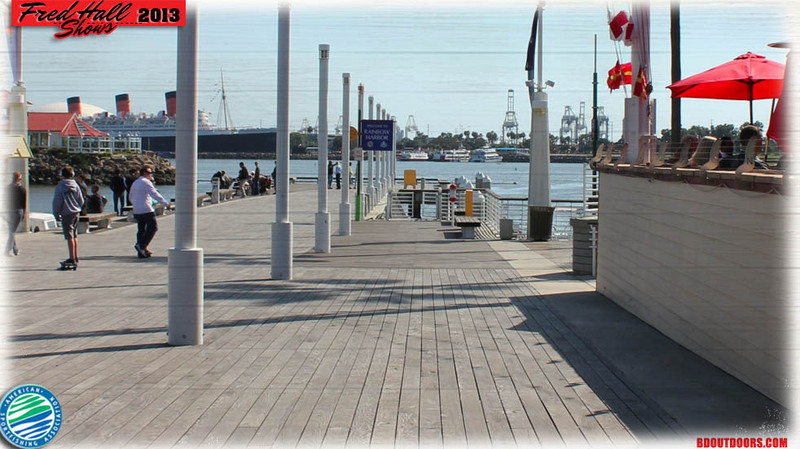 These redfish rods will work awesome for our calico bass. 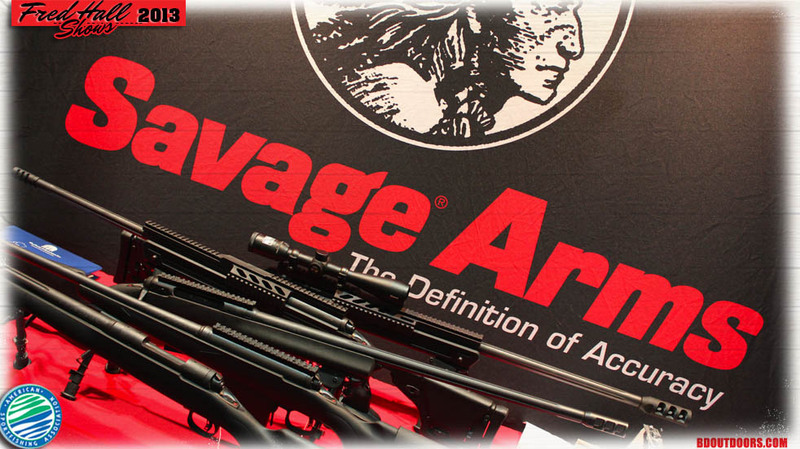 Savage Arms displayed their full line of guns. 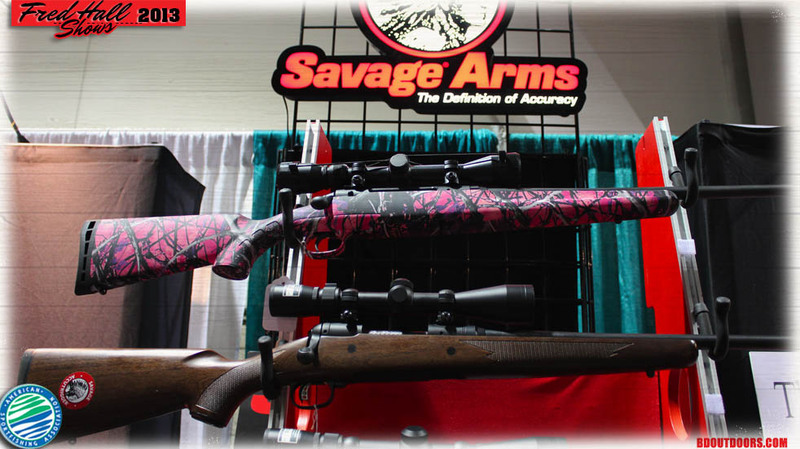 A couple sweet Savage hunting rifles ready to hunt. 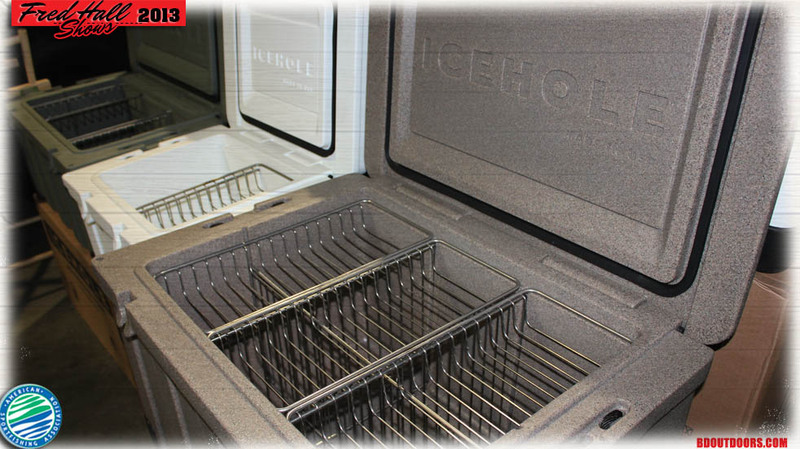 Ice Hole coolers was new to the show and had a very cool line of high end coolers. 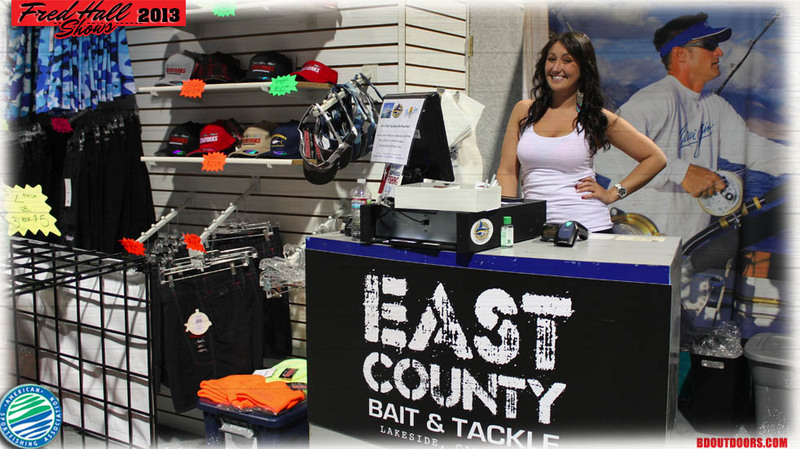 The Bongo’s girls were back at the show this year! 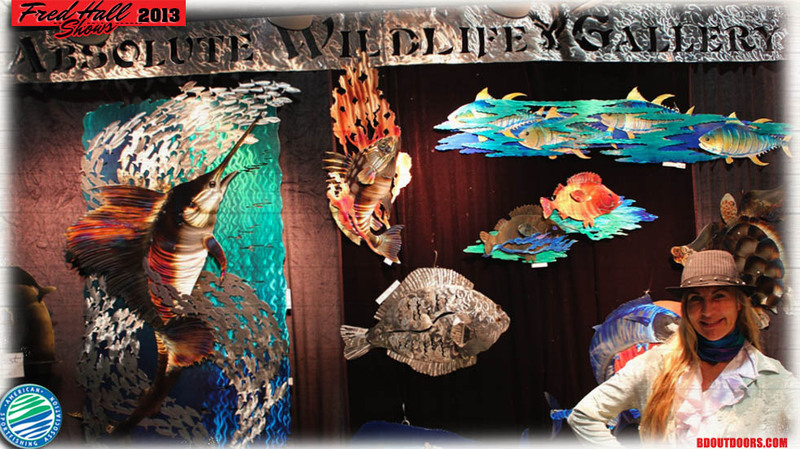 There was plenty of awesome marine and wildlife art on display at the show. 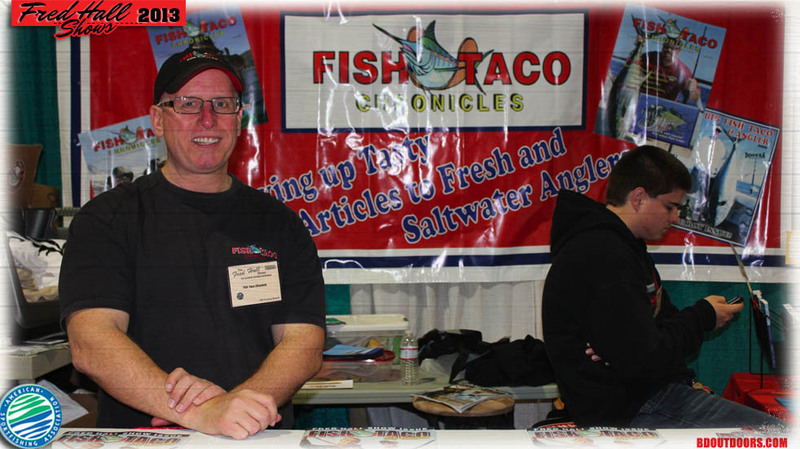 Sean Arnold vigilantly mans the Fish Taco Chronicles booth. 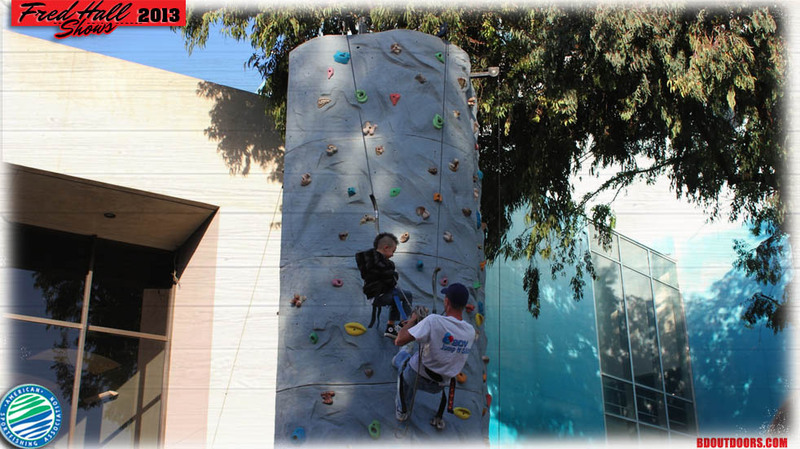 The outdoor rock climbing was a huge hit. 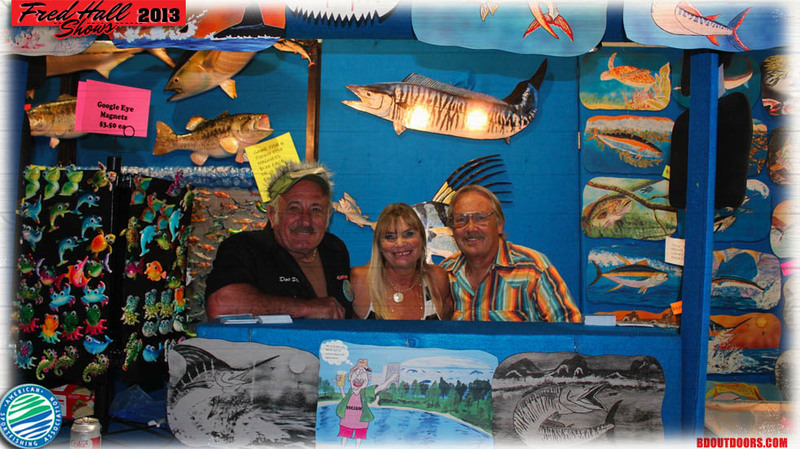 Doc Ski, Vicki and Rocky were on hand as usual selling their cool art. This guy was REALLY excited about the BD booth. 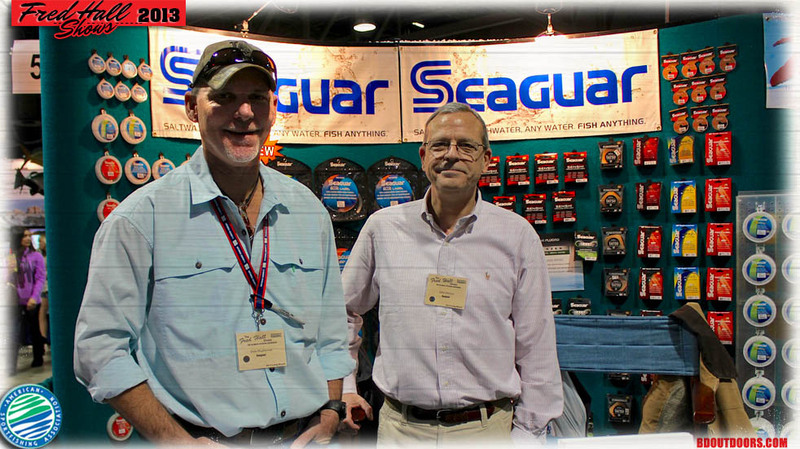 Seaguar reps were on hand showing off their latest and answering questions. Capt. Jimmy Decker answers a few questions for a fellow angler. Towards the end of the show vendors can get a little on the crazy side. This metal marine art was amazing in person! 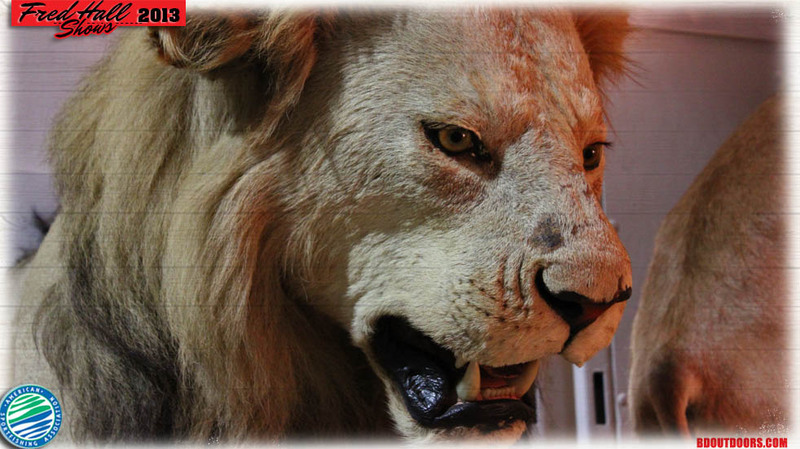 The Safari Club brought a huge semi trailer full of exotic mounts. 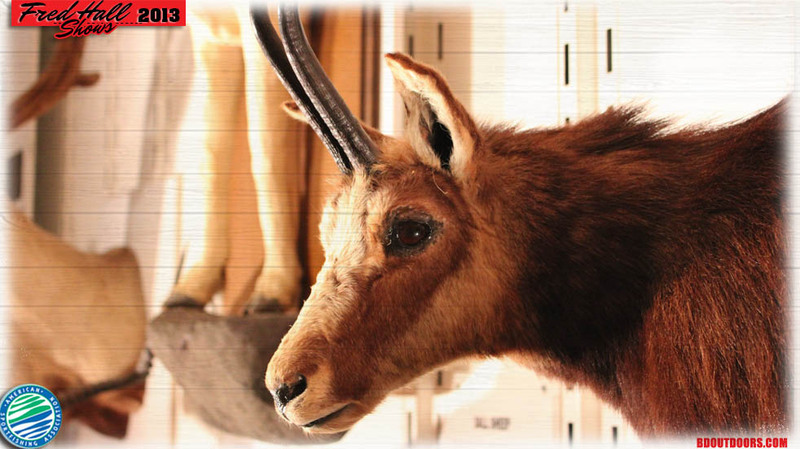 Another awesome mount from the Safari Club semi trailer. Big fish eat big baits. 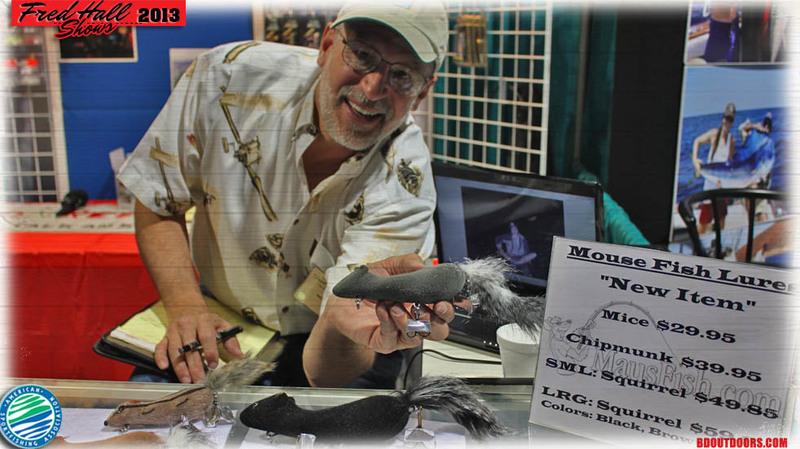 Here a vendor shows off a giant mouse lure! 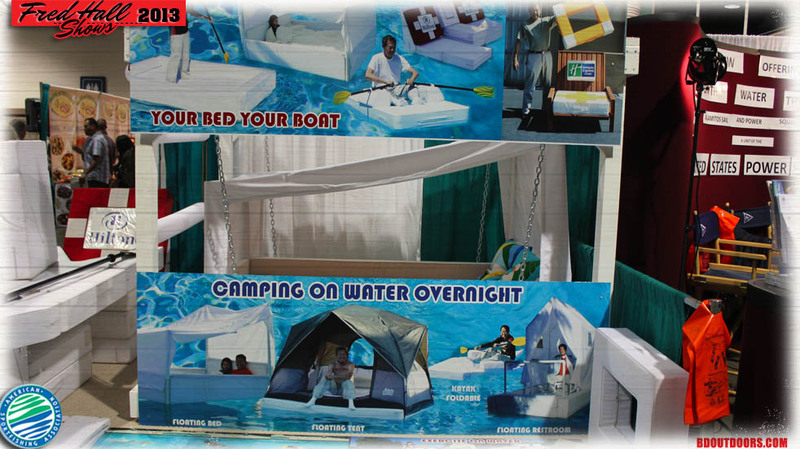 Ever wish you had a floating bed, bathroom, or tent? 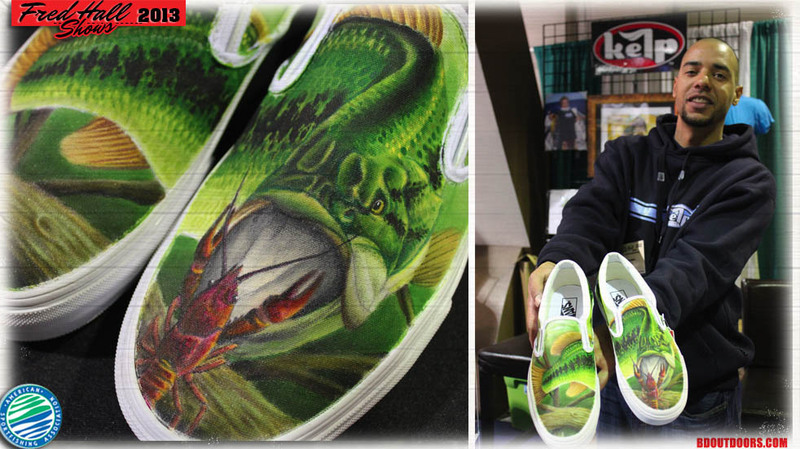 BD member Tatuna (Charles Benalvides) shows off a custom painted pair of Vans shoes he was raffling off. 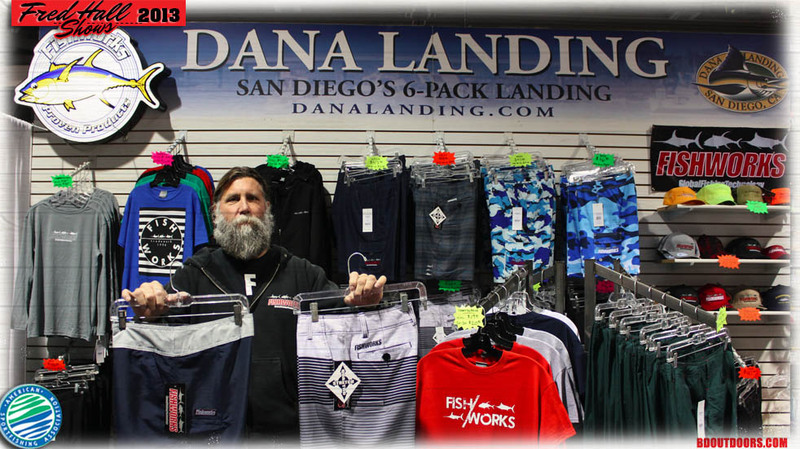 He also had his entire Kelp clothing line on display with some very cool SoCal oriented designs. 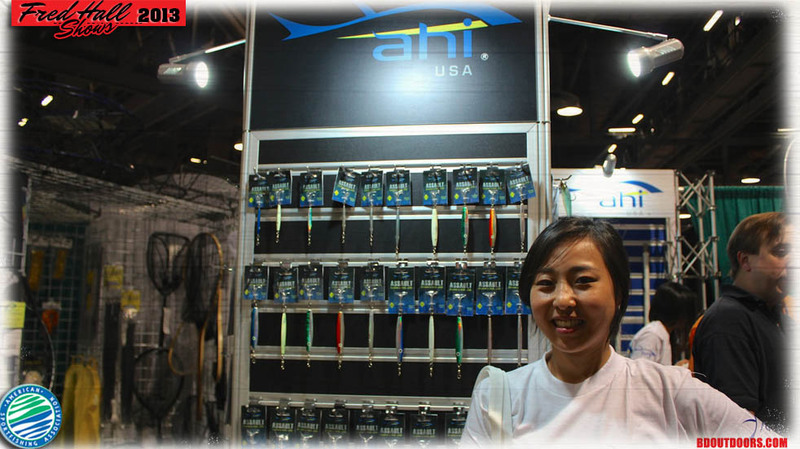 Ahi / Promar was displaying their complete line of nets, lures and accessories. 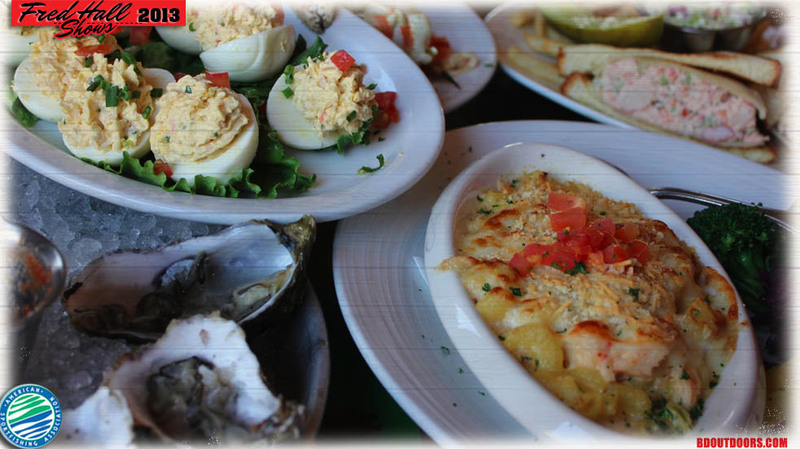 We had a little time to sneak away to Gladstone’s across the street from the show and got some killer seafood. 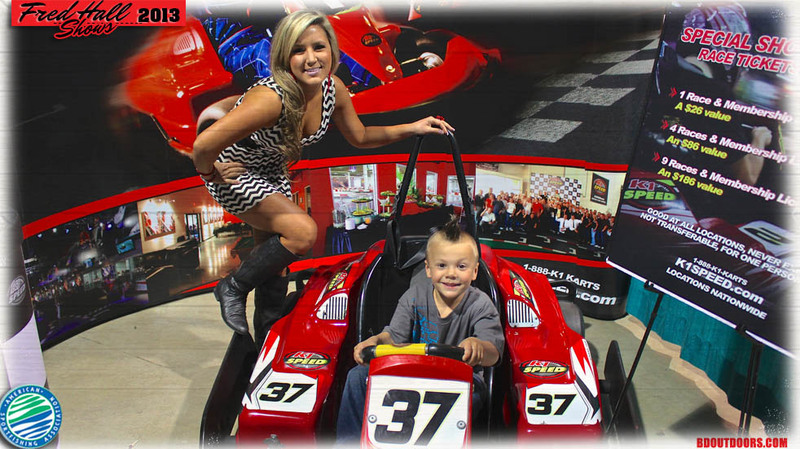 K1 Speed way was on hand promoting their indoor go cart race tracks. 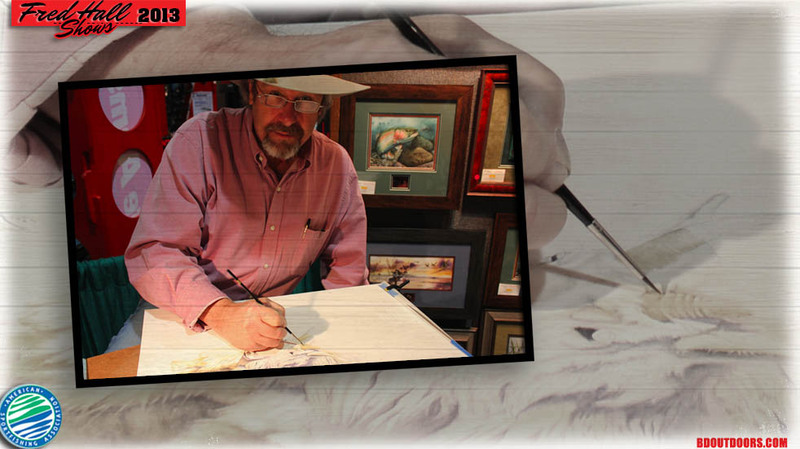 One of the wildlife artists hard at work at the show with a new creation. BD member Capt. Cabo takes a minute to walk the show with the family. Before becoming the Creative Director for BD Outdoors, Derek Redwine owned and operated the web development and design firm BoldWater for more than 16 years. 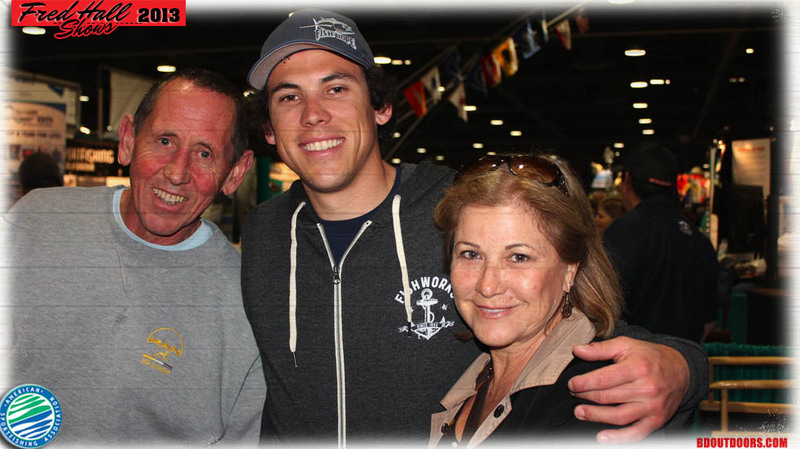 Derek has an extensive fishing resume, and began his career working as a mate on various charter boats based out of central Florida. 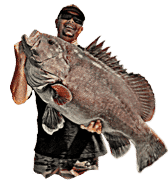 He started fishing the Bahamas at an early age with his father, and has traveled to some of the world's best fishing locations including Venezuela, Costa Rica, Mexico, Nova Scotia, Alaska and the Caribbean. He's appeared in many magazines over the years and has been a guest on the television show Spanish Fly with his close friend Jose Wejebe twice. Derek lives in Merritt Island, Florida, with his wife Cory and son Alden.